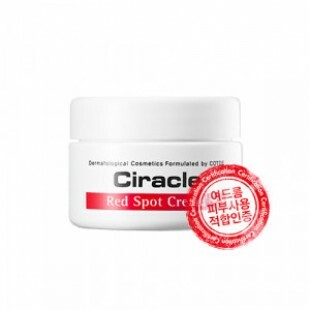 Why did millions of Korean women chose the Red Spot Healing Cream? Because it is the most effective scar healing cream! Don't be sad about acne scars anymore. FeaturesThe best scar healing cream to treat your acne scars ! Big hit acne product in Korea, 98 percent of customers said "Excellently Satisfied "You can see fast respond from this little container. Brings you great soothing effect. Ciracle believes that every scar can be healed. Red Spot Healing Cream will not only heal your acne scars but also wounded heart which suffered from your acne scar.Cautious about using it before the makeup. Since its texture is creamy and sometimes little too heavy for the skin. Try to avoid mixing up with other products. In rich cream type form which protects the scars from the harmful environment.Intensive spot care for acne spots and scars. Suitable for any skin type, especially great for sensitive skin to use. Directly delivers great ingredients for skin without any skin irritation. Transform your acne scars into flawless state. RecommendIf you are looking for the best scar healing cream, here it is !To heal troubled spots and effectively cure the acnes, scar healing cream without irritation, Ciracle's millionseller item, Red Spot Healing Cream ! 1) Apply on overall face with trouble mark as the center after toning in day and night.2) If you want to feel the fast absorption, it would be better to apply Spot Healing Cream right after toning.It is also effective to apply before the sleep.